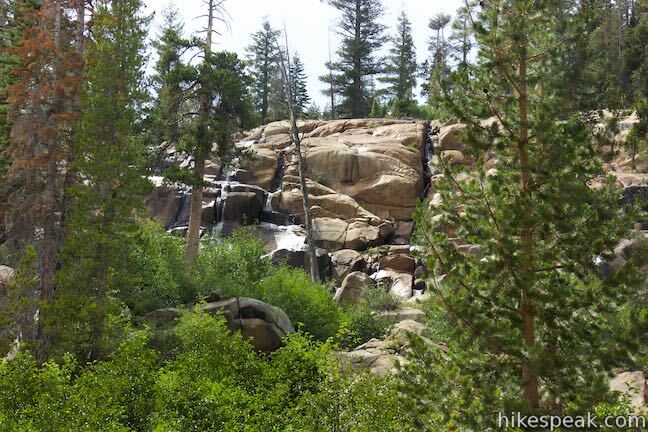 Minaret Falls is a tumbling waterfall in the Eastern Sierra near Mammoth Lakes. 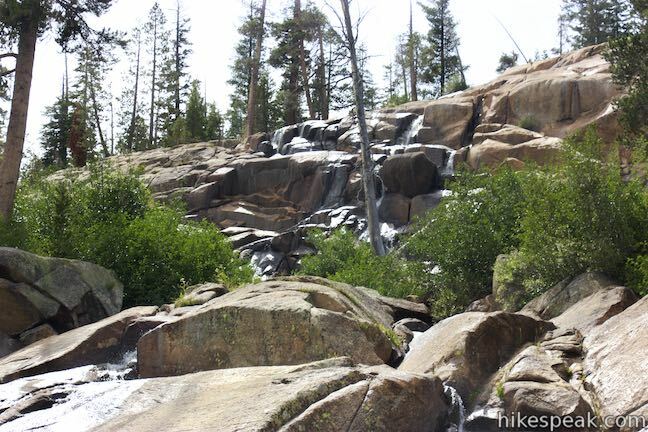 The waterfall plunges a slope above Pacific Crest Trail in the Ansel Adams Wilderness of Inyo National Forest. 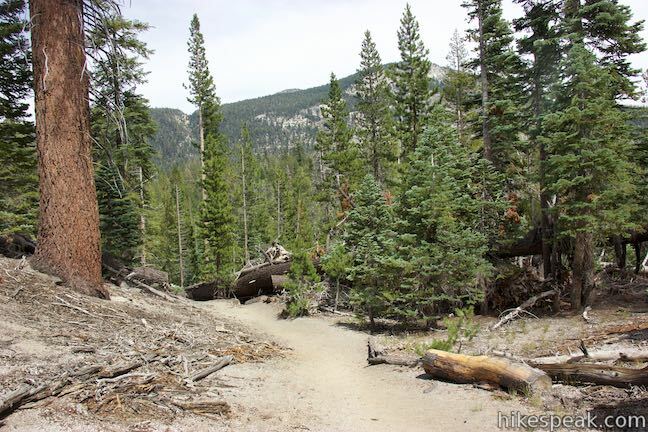 Starting from the main trailhead in Devils Postpile National Monument, it’s a 3-mile round trip hike to Minaret Falls (with the option to link this trail with hikes to Devils Postpile and Rainbow Falls). 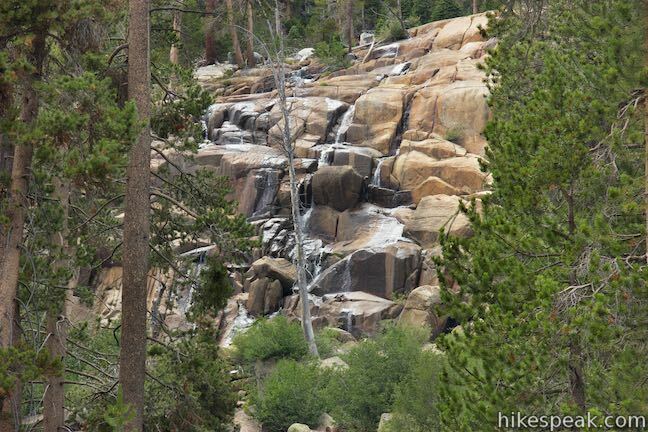 The waterfall cascades some 200 feet and can impress when water volumes are high, but definitely diminishes when water levels are low. 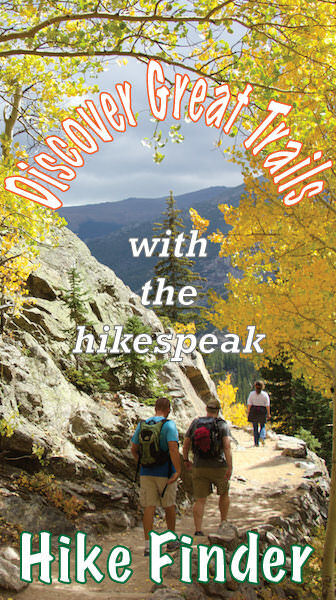 The pleasant hike to the falls crosses through pine forests and is 3 miles round trip with 125 feet of elevation change. 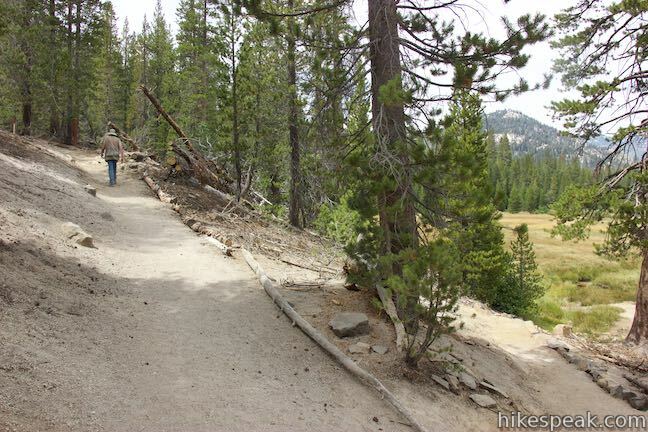 Begin from the end of the road to Devils Postpile National Monument near Mammoth Lakes where you’ll find a ranger station, a campground, and a trail entering the 800-acre park wrapped by national forest. 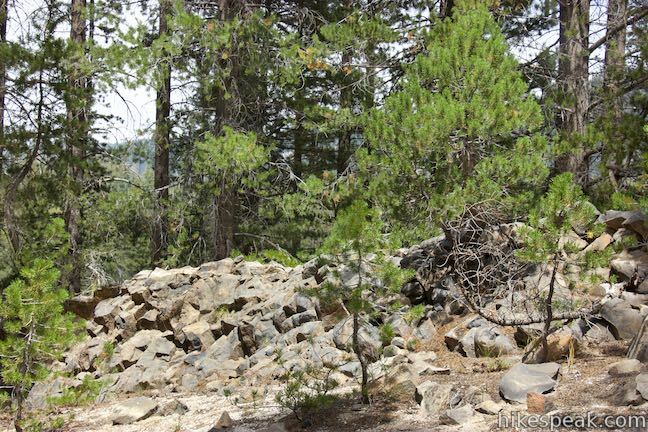 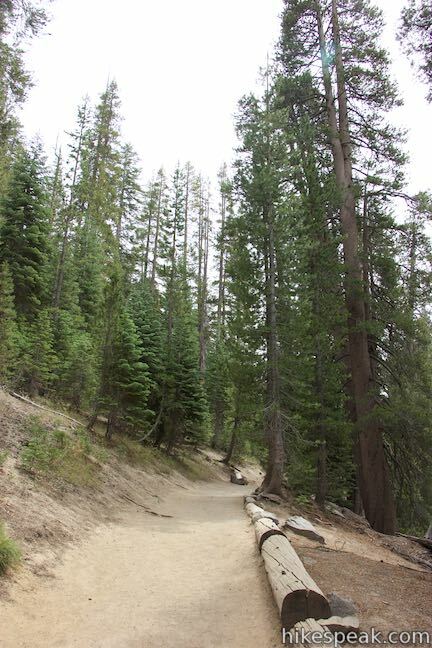 The Devils Postpile Formation is less than half a mile away and a side trail off the monument’s main trail connects to Pacific Crest Trail to reach Minaret Falls. 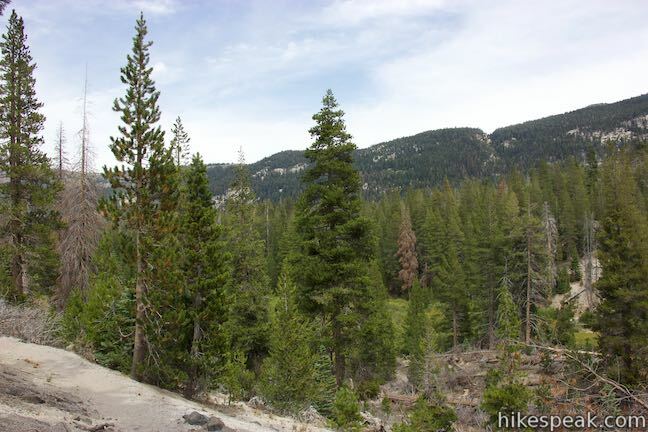 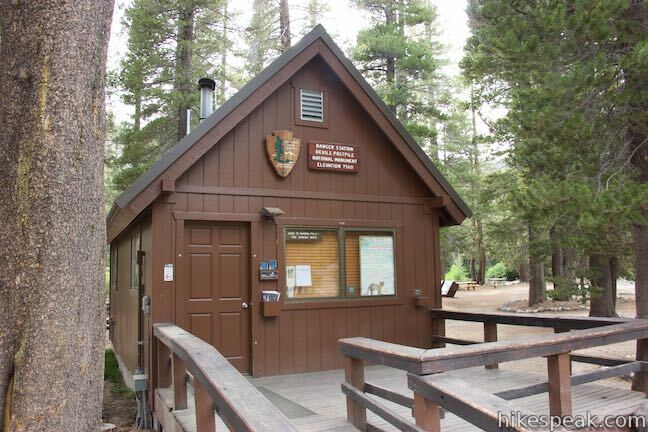 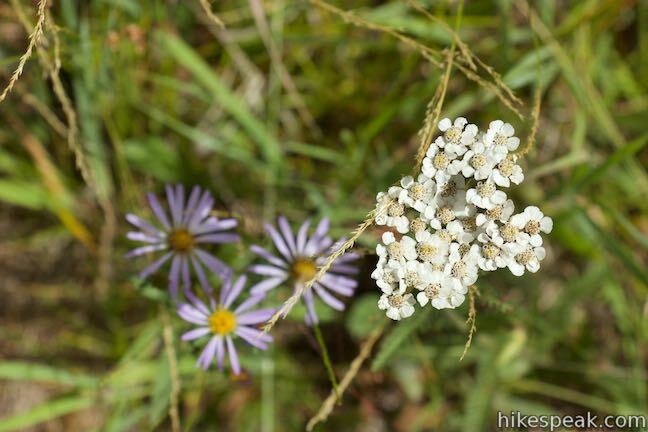 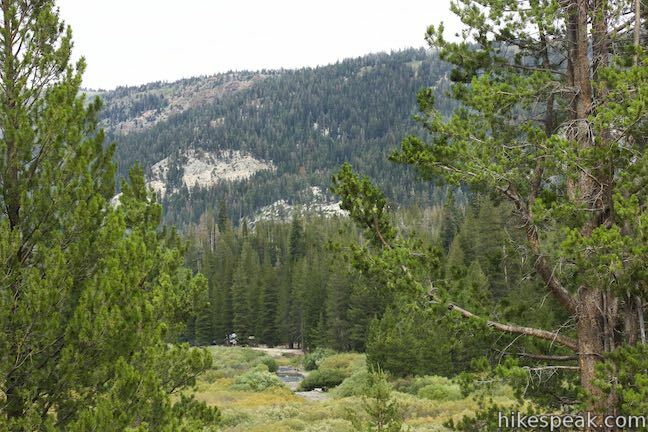 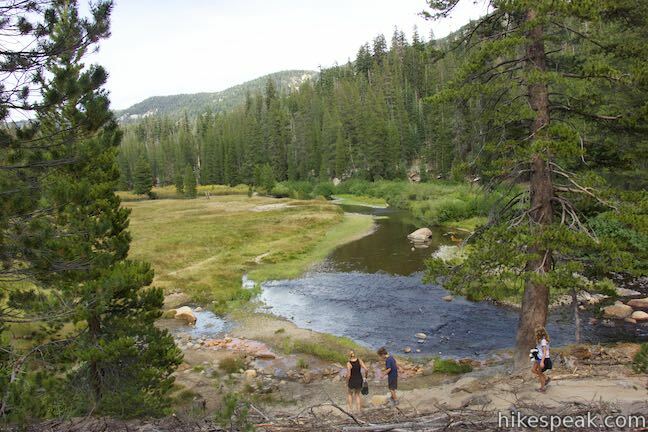 Take the only trail leaving the trailhead and hike along the edge of a forest bordering Soda Springs Meadow, a grassy area along the winding waters of Middle Fork San Joaquin River. 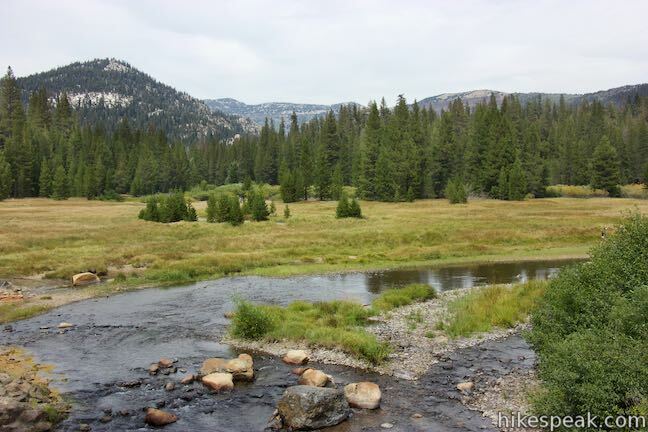 The lovely meadow is backed by pine forests on all sides. 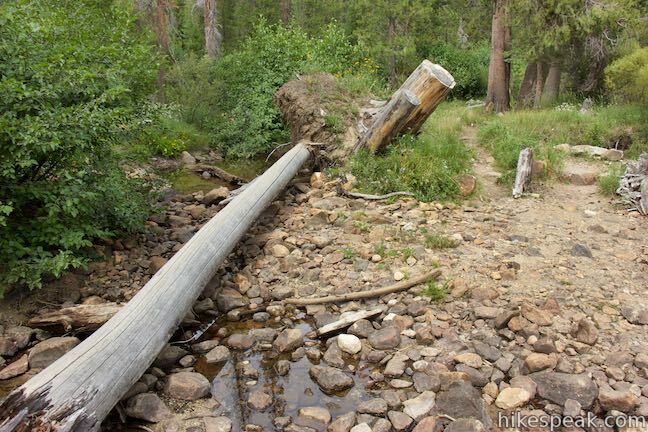 After a quarter mile on the dirt trail, come to a split. 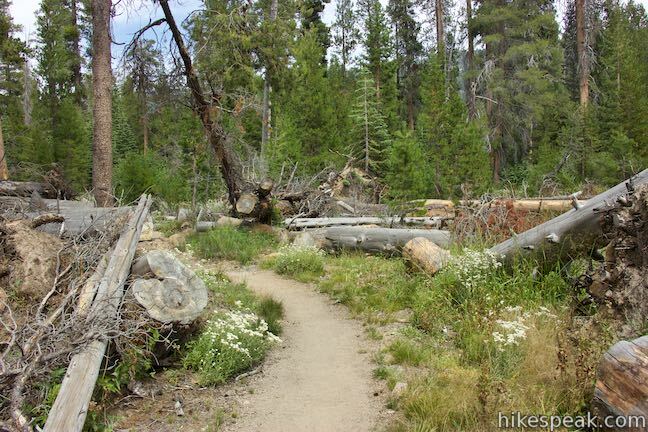 The trail to Devils Postpile and Rainbow Falls proceeds to the left. 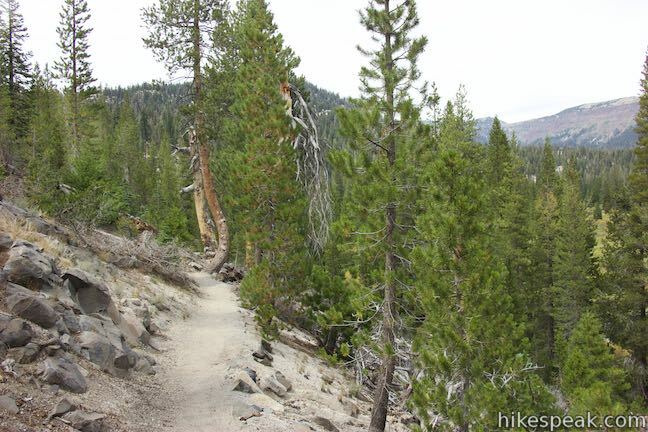 Turn right to hike toward Minaret Falls. 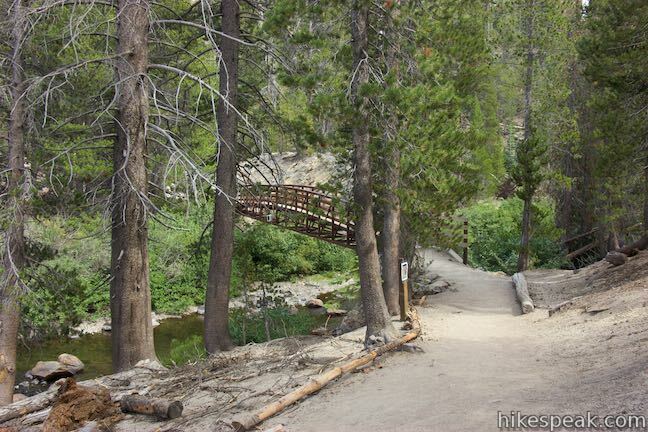 Shuffle up to a second junction where a trail on the left connects back to the other route (forming a triangle-shaped junction) and bear right over a bridge spanning the Middle Fork San Joaquin River. 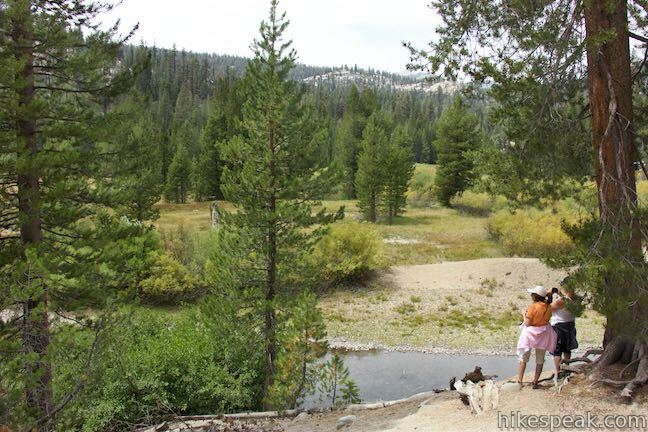 Just upstream and across the river, you’ll spot Soda Springs, where cold water bubbles to the surface of shallow pools right along the river. 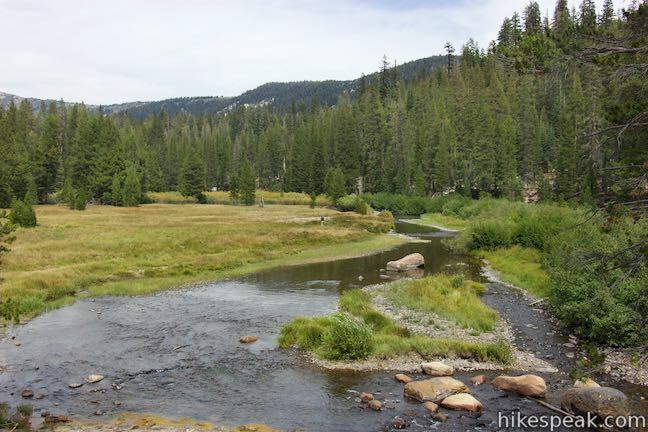 Look up across the lovely meadow or downstream as the river passes through a narrower opening between ridges. 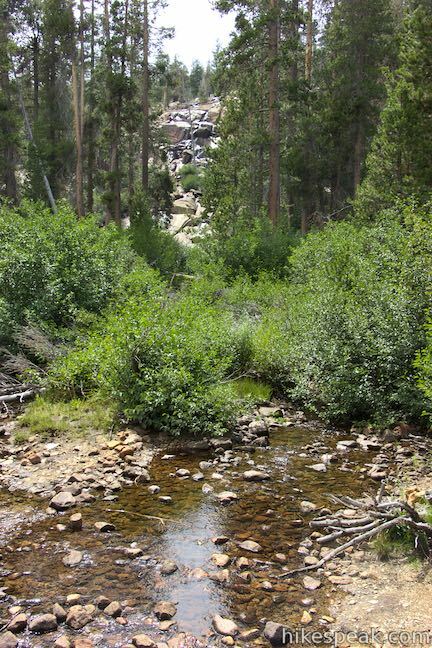 On the opposite side of the bridge, a spur on the right leads down to the spring. 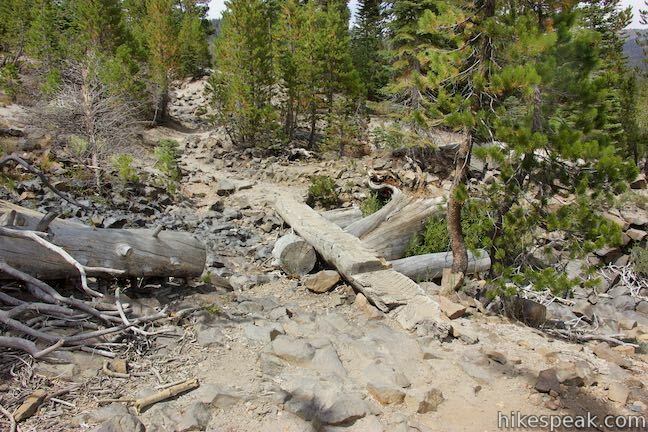 Pass a basalt formation on the left that resembles a miniature postpile. 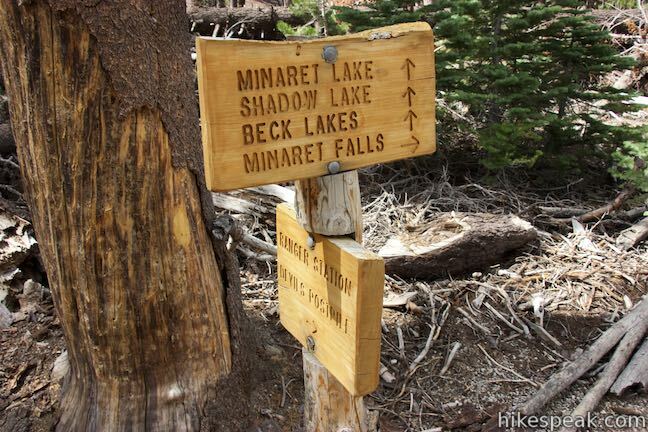 Come to another junction, 0.35 miles from the start, and turn right, following an arrow for Minaret Falls. 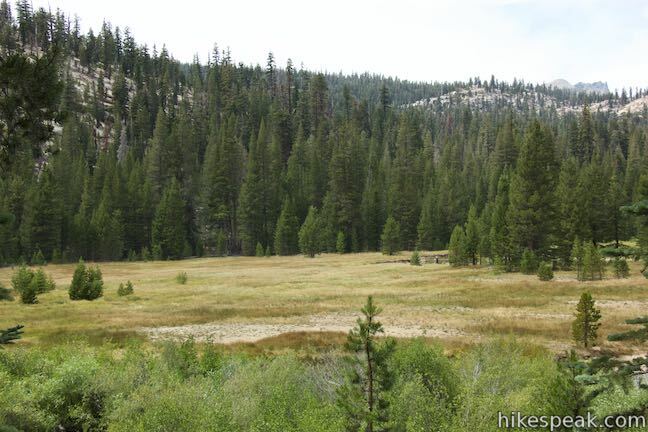 To the left, King Creek Trail goes southeast toward Fern Lake. 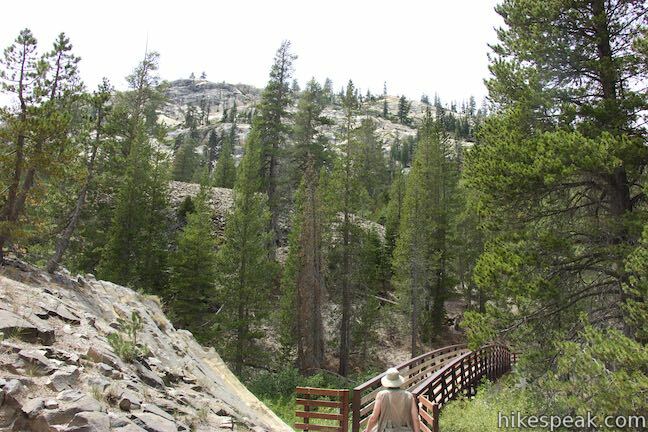 Minaret Falls Trail heads north now along the east side of a valley that surrounds Middle Fork San Joaquin River. 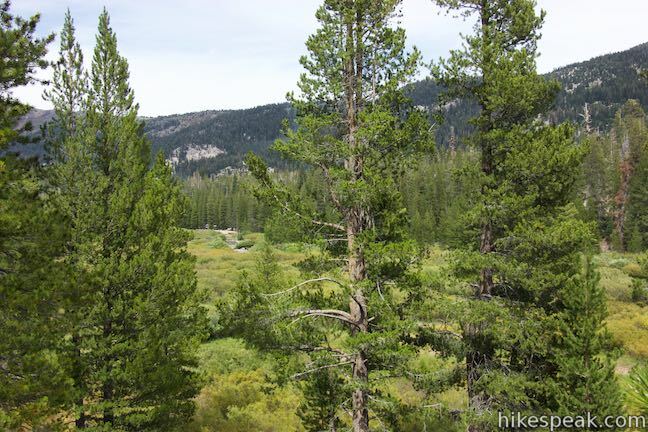 Walk through a pine forest with views to your right over meadows along the river. 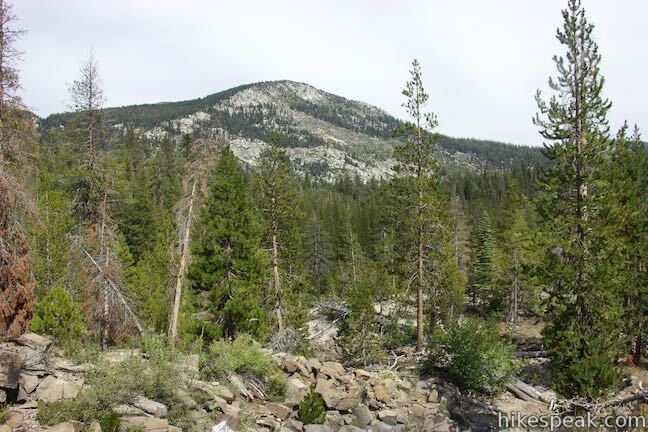 Peaks on the ridge across the valley pop up above the forest. 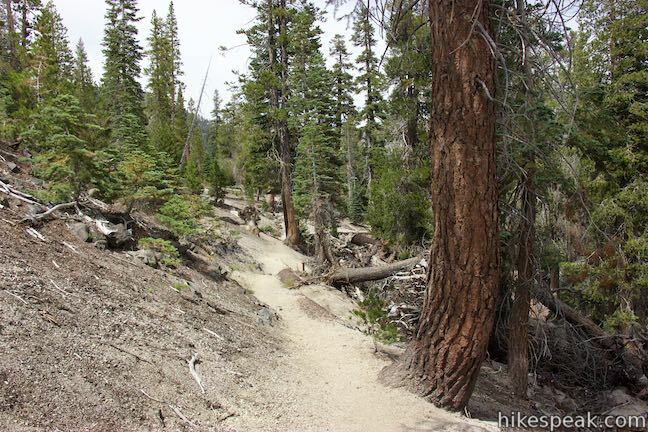 A third right turn comes at 0.85 miles from the start, when Minaret Falls Trail meets Pacific Crest Trail and John Muir Trail. 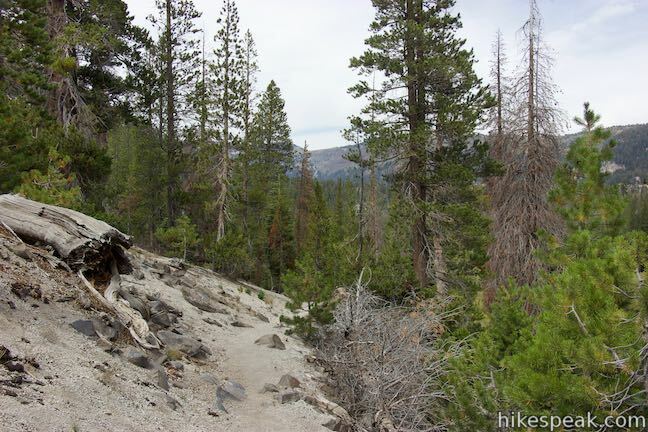 Bear right onto PCT, following the arrow for Minaret Falls. 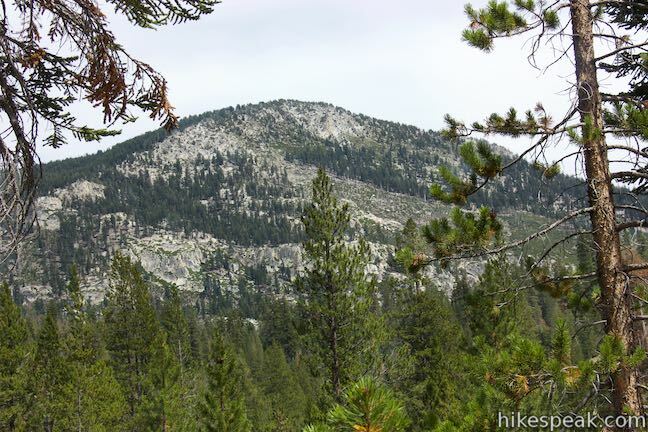 After a tenth of a mile on PCT, you will pass the boundary of Devils Postpile National Monument and enter Inyo National Forest. 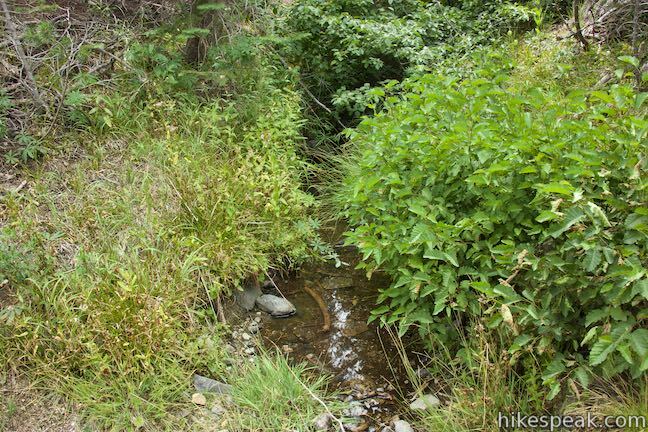 Continue across rolling terrain, crossing a small stream after another 0.2 miles. 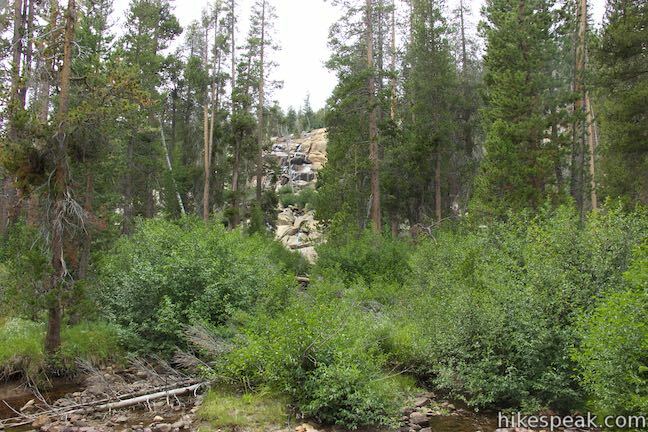 Minaret Falls is located on a larger stream, 0.3 miles farther up the trail. 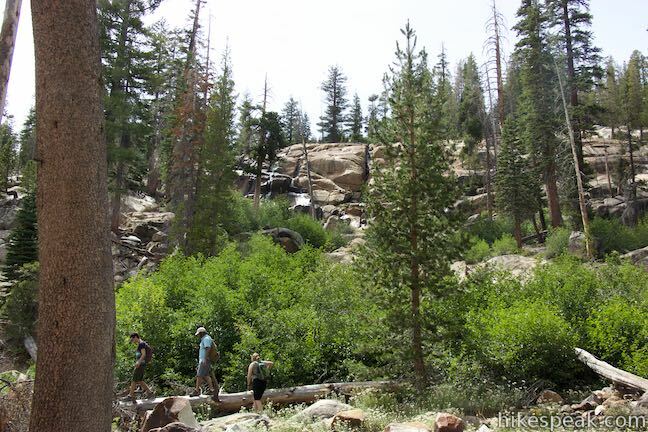 You will hear Minaret Falls and spot cascading water through the trees on the left side of the trail. 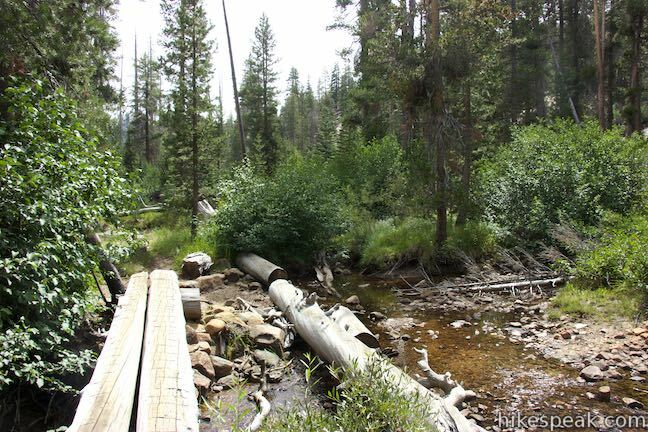 After 0.6 miles on PCT (1.45 miles from the start), come to a log crossing over Minaret Creek. 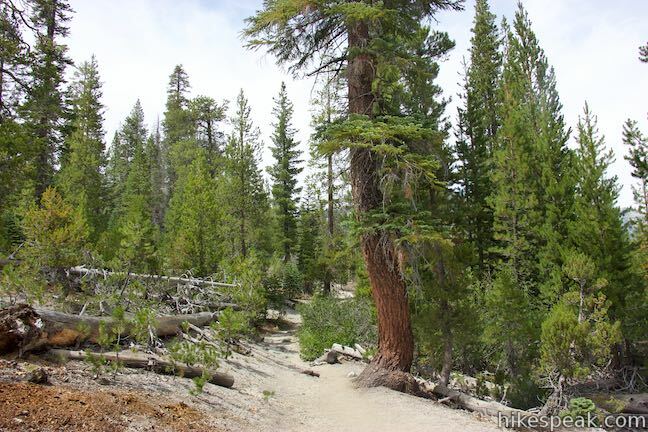 Walk out onto the log to get an upstream view of Minaret Falls. 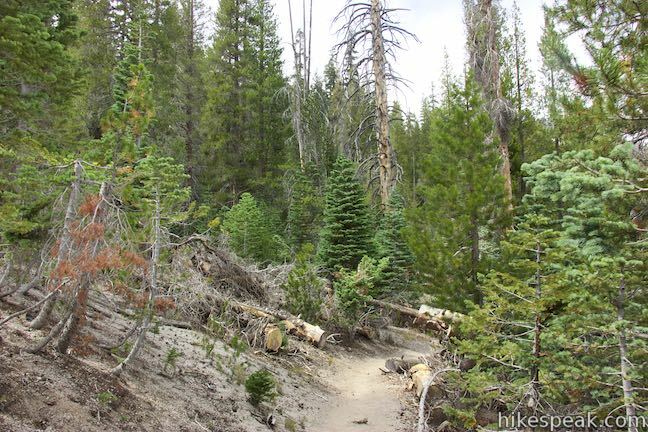 Unless you’re continuing north on PCT toward Canada, backtrack about 200 feet and find a path off the trail that goes to the base of Minaret Falls. 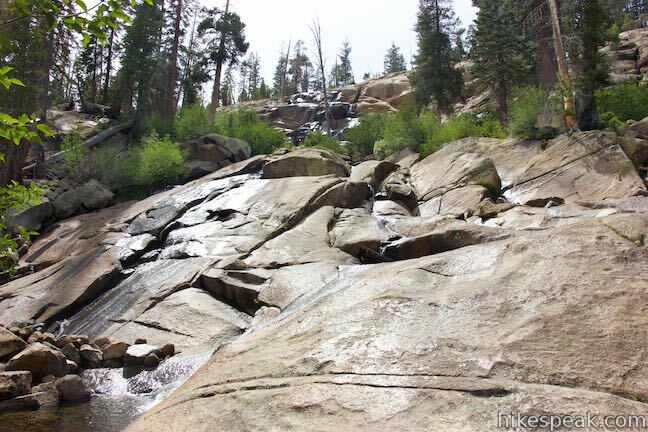 Venture up to the bottom of the waterfall and take it in. 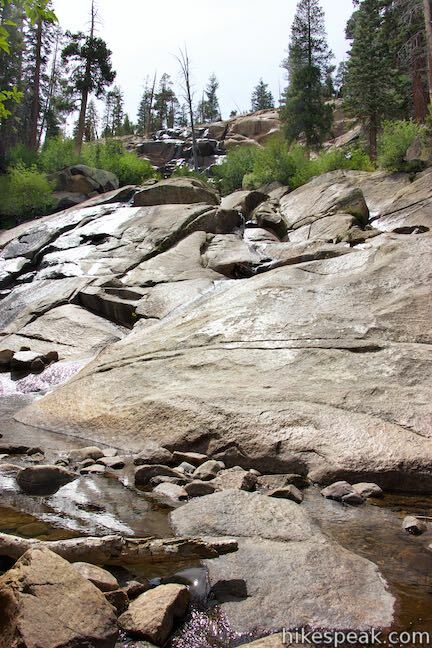 When water flow is low, Minaret Falls becomes an under performing cascade of sliding water. 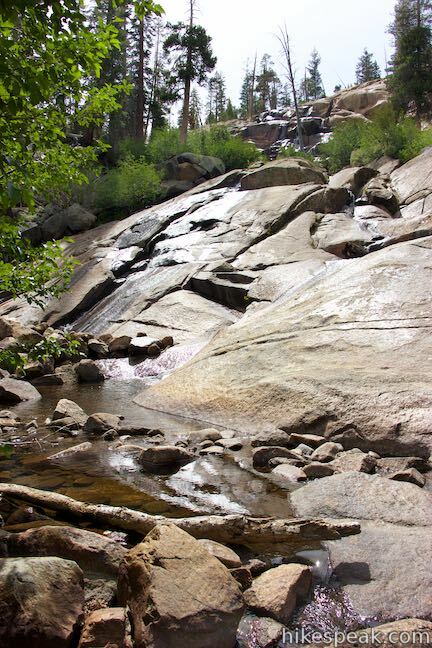 When there is more water, Minaret Falls can grow to a thundering surge tumbling down a 200-foot granite slope. 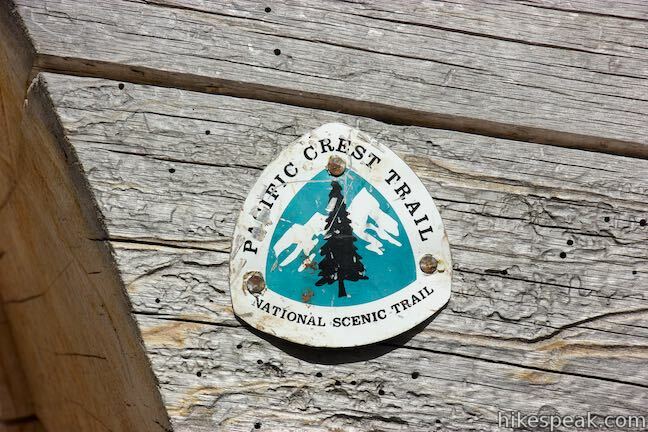 When you’re finished admiring the waterfalls, walk back to Pacific Crest Trail, turn right and head back the way you came. 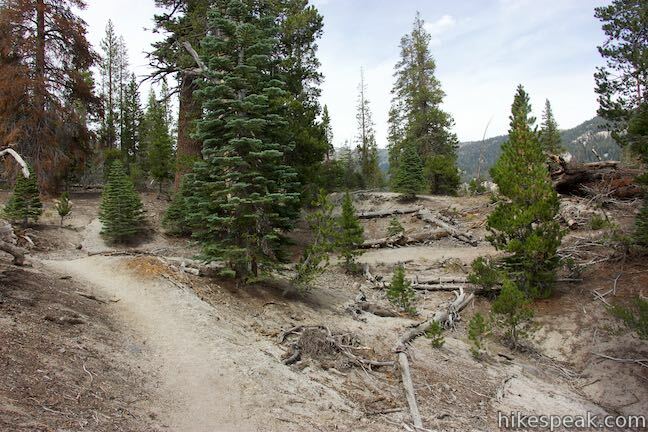 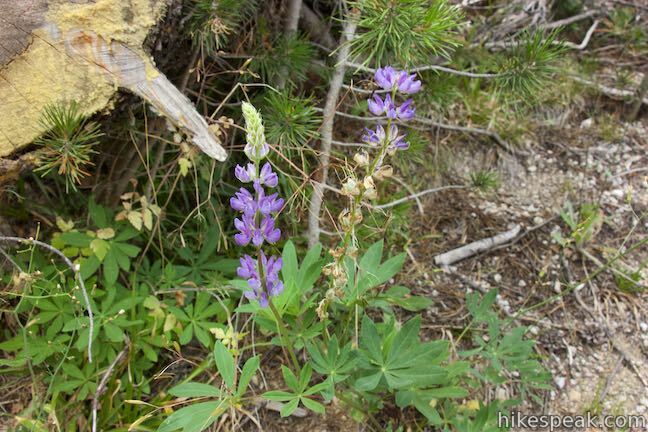 Make a left turn at every junction to return to the start and complete this 3-mile hike. 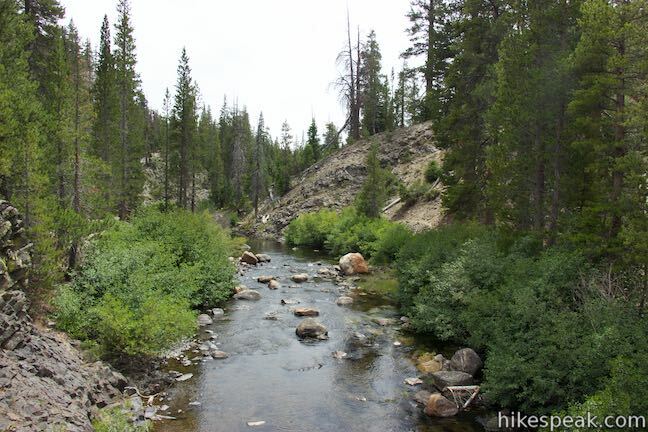 If you like, bear right on the trail to Devils Postpile and hike a tenth of a mile to that star rock formation. 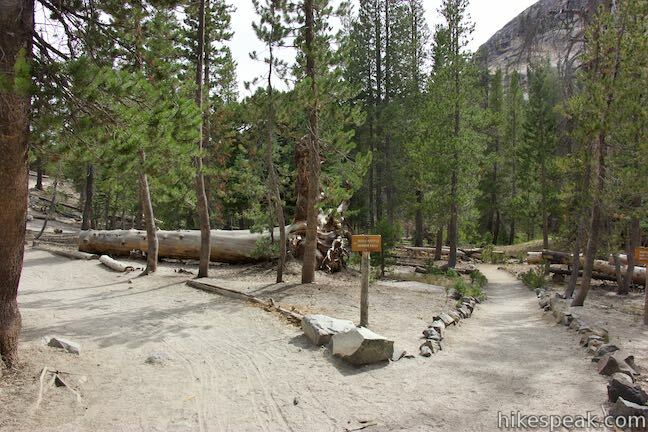 From there, you can explore more of the monument or return to the start. 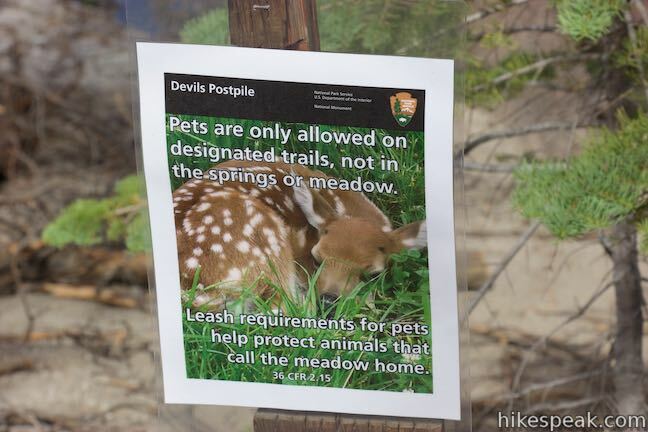 Dogs are allowed on this hike on leashes. 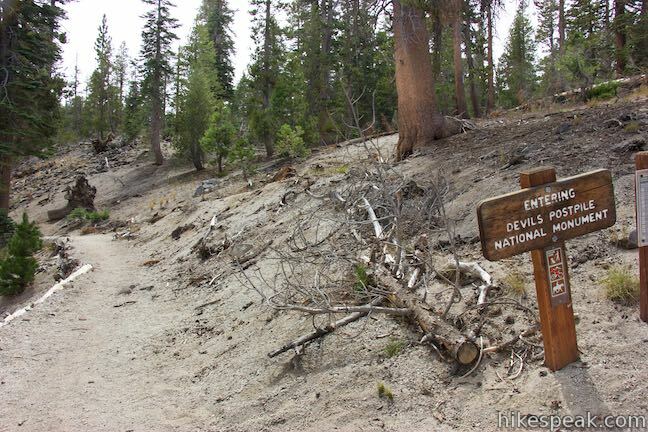 Bikes are no allowed. 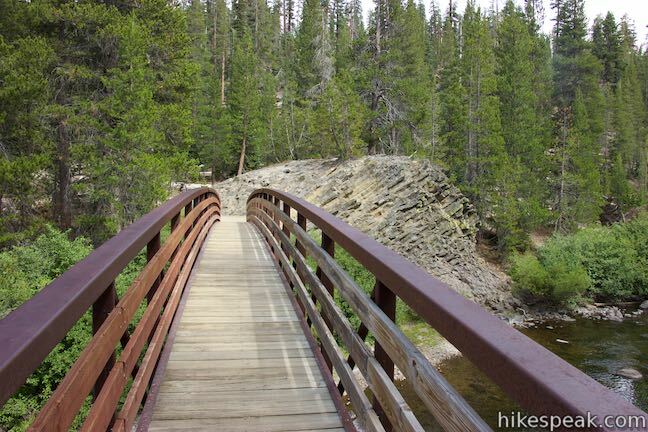 A fee is required to visit Devils Postpile National Monument. 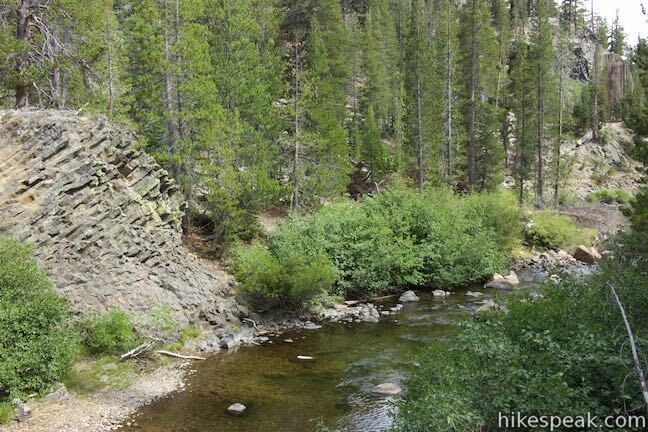 This 1 to 1.35-mile hike visits the columnar basalt cliff that Devils Postpile National Monument is named after, with top-down and bottom-up views of the impressive formation. 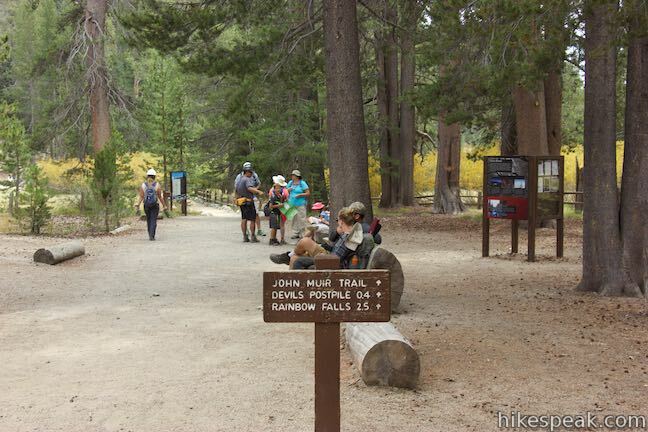 The hike can be extended to include Rainbow Falls at the south end of the monument. 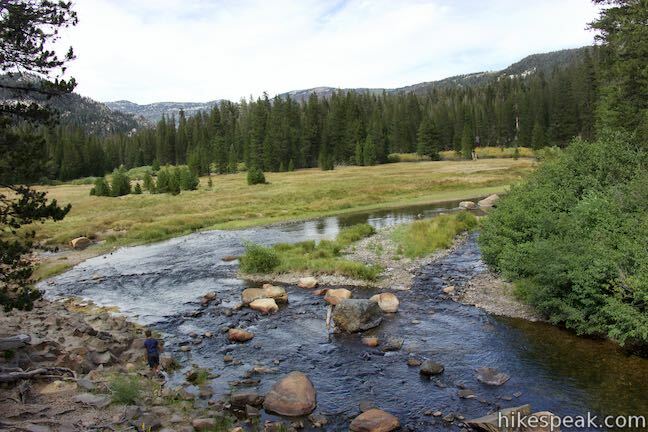 Just came back from Minaret Falls campground yesterday, August, 2018, and the falls are flowing and thunderous. 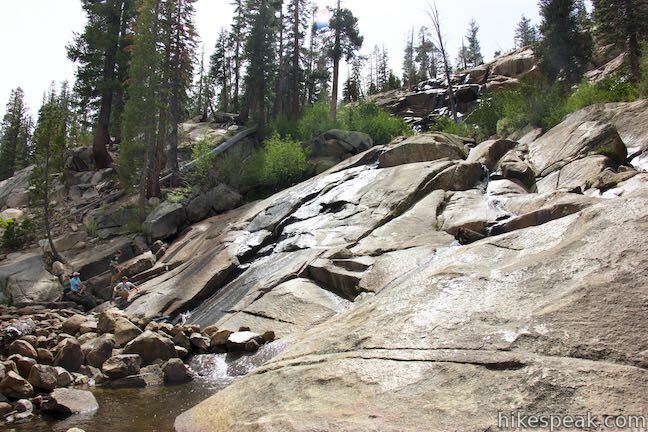 The falls are the first thing you hear when you wake up in the morning. 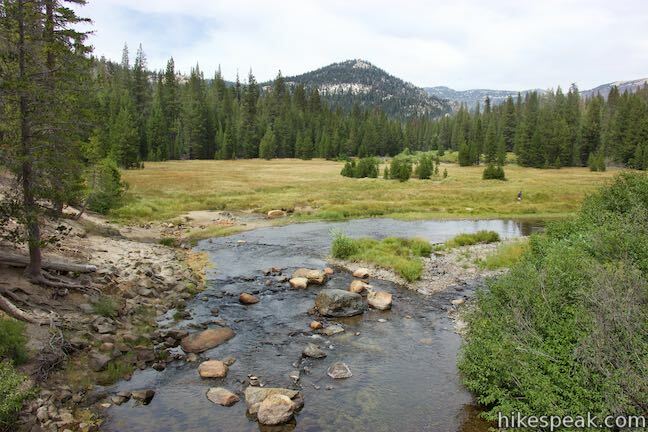 It is warm in the afternoons and cold at night. 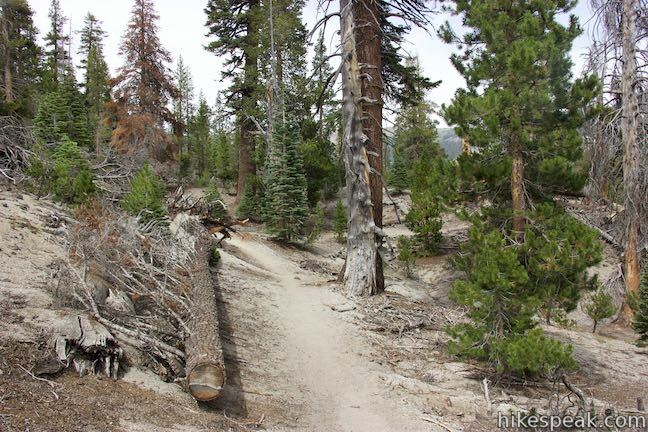 A bit smoky in the early AM because of back burning, but doable.